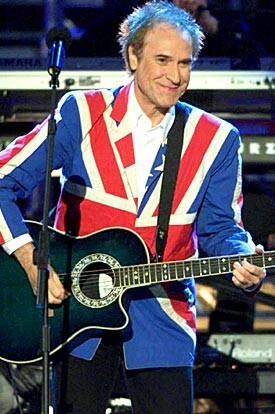 Kinks leader Ray Davies said he recognizes similarities between plot of “Preservation” and recent scandal in Washington, D.C.
Kinks leader Ray Davies hadn’t given permission for anyone to perform a full production of their rock opera “Preservation” since the seminal British rock outfit performed the piece during its 1974 tour. Surely he had his reasons. But after seeing a rehearsal of the recently revived work Sunday, Davies said he feels he’s done the right thing by letting the Boston Rock Opera give the piece a go. Staged in the Tower Auditorium in Boston, a 450-seat theater on the Massachusetts College of Art campus, the Boston Rock Opera’s production of “Preservation” begins Friday (Oct. 2) and continues through a three-weekend run that ends Oct. 17. With musical selections culled from two Kinks albums, Preservation Act 1 (1973) and its 1974 follow-up, Preservation Act 2, the current production by the New England-based theater company is set in “the Village” and traces the struggle of the villagers in choosing between Machiavellian leader and cold-hearted real-estate magnate Mr. Flash and his seemingly squeaky-clean rival, Mr. Black, a choice that proves to be little better than hopping out of the frying pan and into the fire. Tossing aside her guitar and mic, Kay Hanley of Boston-based poppers Letters To Cleo plunged into the role of Mr. Flash’s longtime love interest, Belle, joining a cast that includes Boston Rock Opera co-founder Mick Maldonado in the role of Mr. Flash. Based on his viewing of the rehearsal, Davies noticed several basic differences between the Boston Rock Opera’s version and the one his legendary pop-rock act took on the road nearly 25 years ago. Ramsay, co-founder of the Boston Rock Opera — whose past productions include “The Rocky Horror Picture Show” and a reading of “Jesus Christ, Superstar” with Gary Cherone, newly acquired frontman of the pop-metal act Van Halen, in the title role — said the set itself mirrors the crisis in the sickened village. The similarities between the basic plot of “Preservation” and the recent political machinations in Washington, D.C., were not lost on Davies, whose description of one scene from the play could have just as easily been describing President Bill Clinton’s month-long mea culpa for his involvement with ex-White House intern Monica Lewinsky. Posted in Preservation, Press and tagged preservation.